Constructed: 800 – 1200 A.D.
Angkor Archaeological Park is located in northern Cambodia which is one of the most important archaeological sites in Southeast Asia. This archeological site is located about 5.5 km (3.4 miles) north of the town of Siem Reap. The town of Siem Reap is the primary access point for the Angkor Archaeological Park and is the tourist hub for the area. The most famous are the Temple of Angkor Wat and, at Angkor Thom, the Bayon Temple with magnificent sculptural decorations. Siem Reap is a major tourist destination and Angkor is located about 20 minutes to the north from central Siem Reap. The airport is around 7 km from the town center. Siem Reap International Airport is the second largest airport in Cambodia with modern architecture is based on the traditional Khmer style. 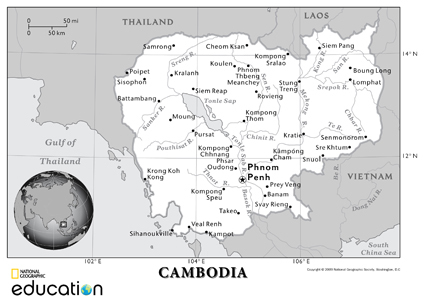 Siem Reap is also well connected to Cambodia’s capital, Phnom Penh. Tourists can travel between these two cities using buses, taxis, or boats. Other modes of transportation to getting around include bicycles, motorbikes, cars, and tuk tuks. Being the closest 5 star luxury international hotel to Angkor Wat itself, Le Meridien is the perfect choice for travelers afar, who want to be close to the very reason for visiting. And the rustically colorful township of Siem Reap with its charming French colonial buildings and 400 years old teak trees is just 5 minutes from the hotel where local markets, art galleries and cafes abound. Conveniently near the airport in Siem Reap, Le Meridien Angkor is close to Angkor National Museum, Royal Garden, and Lucky Mall Super Market. 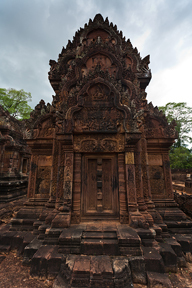 Also nearby are Wat Preah Prom Rath and Preah Norodom Sihanouk-Angkor Museum. Set in landscaped gardens on Charles de Gaulle Avenue, Sofitel Angkor Phokeethra Golf and Spa Resort is the closest Siem Reap hotel to the ruins of Angkor Wat. This unique Siem Reap Cambodia hotel is situated near traditional markets, tourist attractions and the airport. Enjoy the many features of Sofitel Angkor Phokeethra Golf and Spa Resort, including 238 rooms, a swimming pool, Jacuzzi, spa, five restaurants, the Phokeethra Country Club, and a world class 18 hole golf course. This luxury resort is situated in the historical district and is close to Angkor National Museum, Royal Garden, and Siem Reap Royal Residence. Also nearby are Lucky Mall Super Market and Wat Preah Prom Rath. Tara Angkor Hotel is the first 4-Star Luxury Hotel built in the mystical land of Angkor, an ideal base to explore Siem Reap and the magnificent temples steeped in legend and history. As an Ideal and convenient location, Tara Angkor Hotel is situated only 6 km from the World Heritage site of Angkor Wat Temples, 15 min drive from the Siem Reap International Airport, a few minutes stroll to the Angkor National Museum and a short ride to the city town center with an array of Cambodian souvenirs, shopping and culture. Have you already visited Angkor Wat or plan on visiting? Do you have an interesting Angkor Wat travel story? We would love to hear about your Angkor Wat travel experiences, your reviews of hotels, restaurants, or tours, your top travel tips and any recommendations...anything about the Angkor Wat travel that you can share with us. "Angkor National Museum is a must place to see by everyone. Obviously, visiting the museum together with Angkor historical sites will make your trip completed and meaningful as it gives a background and full understanding about the ancient Khmer Arts, religious Culture and its unique Civilization." Be mesmerized on this Angkor Wat private tour from Siem Reap. Tour of Cambodia's Royal Temples of Angkor,l begin at the south gate of Angkor Thom City and explore the Bayon before continuing to Baphuon temple, the Royal Enclosure and Phimeanakas, the Terrace of Elephants and Terrace of Leper Kings. After lunch, spend most of the afternoon in Angkor Wat before returning to Siem Reap. Discover the mysteries of Angkor on this full-day, small-group temples tour from Siem Reap. See the iconic Angkor Wat and the enigmatic faces of Bayon temple. Wander around Ta Prohm, where the trees are intertwined among the ruins, and enjoy a traditional lunch in the forest. This is a perfect tour for those who want to see the highlights of the Angkor temples in one day.